This is part of a series, and as I read it as a standalone, I fear I have missed some of the background. I would recommend that you read them in order, because I am certain that my experience was less good, because I wasn't fully aware of the dynamics of this group. 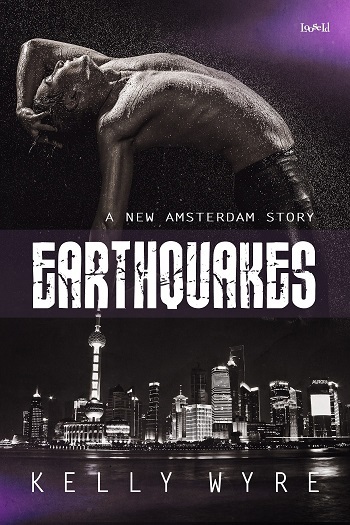 Kelly Wyre is a new-to-me author, & I read Earthquakes as a standalone, as I didn't realize this was book 4 in the New Amsterdam series when I agreed to read for review. However, I wasn't in the least confused. But Earthquakes did make me curious about its predecessors. I will admit I had a difficult time getting into the novel. With a ton of inner monologue and ruminating, the writing style is more descriptive than I enjoy, with not only the scene set with the environment and clothing and appearances, but also action – example: I walked across the room, got a coffee mug out of the cabinet, and poured myself a cup of coffee. That sort of description, which always has me trying to find the plot and character development buried beneath. Even though the writing style wasn't to my tastes, I was eventually able to fall into the story. But I won't lie; I will admit I found myself skimming pages at a time of inner monologues and descriptive action and appearances. My imagination was able to fill in the blanks of each step involved for every action the narrator did, so I skimmed the play-by-play. Obviously I came into some difficulty when past narrators cropped up, as this is the only book I've read in the series, but I was able to roll with it. I do fear it subconsciously effected my overall enjoyment, as I was not emotionally connected with these characters yet. They were strangers to me. As for the plot and romance, I had a hard time buying their mutual attraction, after having no conversations with one another. It was creeping up on 40% before they truly spoke to one another, and I mean more than the grunts Bryn provided at the shooting range. Half of a book based on romance between the narrators, when they never shared a scene with one another, while Ellis engaged with his friends. Ellis was speaking to his friends about how much he was in love with Bryn, while also ruminating about it at length in his thoughts. Yet he knew nothing of this man, a man who gave him no inclination that the attraction was mutual. In retrospect, that type of thinking was a bit off-kilter and stalkerish, entitled perhaps. Thinking the Bryn would just be okay with this fantasy Ellis was building up in his mind. Obviously, since this is 3rd person dual-narration, we hear from Bryn, but if we didn't, Ellis's fixation was a bit creepy. Not his lust at seeing Bryn, but the fantasy he was creating in his head. I love Bryn (even though we've never had a simple conversation and I know nothing of him personally, and he's refused to engage me every time I've tried. But I'm going to keep thinking about how much I'm falling in love with him – creepy). You have to know someone to love them – you have to fall in love with the specifics, not the fantasy you're building up in your mind. That's false – your imagination building up a person who doesn't exist, because you don't know them enough to accurately portray them in your private thoughts. This was 40% of the book. Bryn was a highly interesting character, but I was disappointed as most of his story was off-page. More telling than showing. It had much potential, and I would have loved to truly immerse myself into Bryn's backstory/story, but it was just written away when it was the most intriguing part of the books itself. Truthfully, as I read Earthquakes, I never dialed into the narrators, and the entire time I was more curious about the 3 books I'd missed and the stories those characters had to tell. In my downtime, I may look into book one before I make a decision on whether or not this author's writing style doesn't suit with my tastes. As another reviewer stated the other books were more involved. Recommended to fans of the New Amsterdam series, MM romance fans. But beware, you should most definitely read these books in order, as even to the last page I just wasn't feeling it. Kelly Wyre enjoys reading and writing all manner of fiction, ranging from horror to romance. She used to work in advertising but is now happily chained to her writing desk and laptop. Kelly relishes the soft and cuddly and the sharp and bloody with equal amounts of enthusiasm. She's a coffee addict, a workaholic, a chronic night owl, and loves a good thunderstorm. Currently Kelly resides in the southeastern United States. Reviewers on the Wicked Reads Review Team were provided a free copy of Earthquakes (New Amsterdam #4) by Kelly Wyre to read and review.